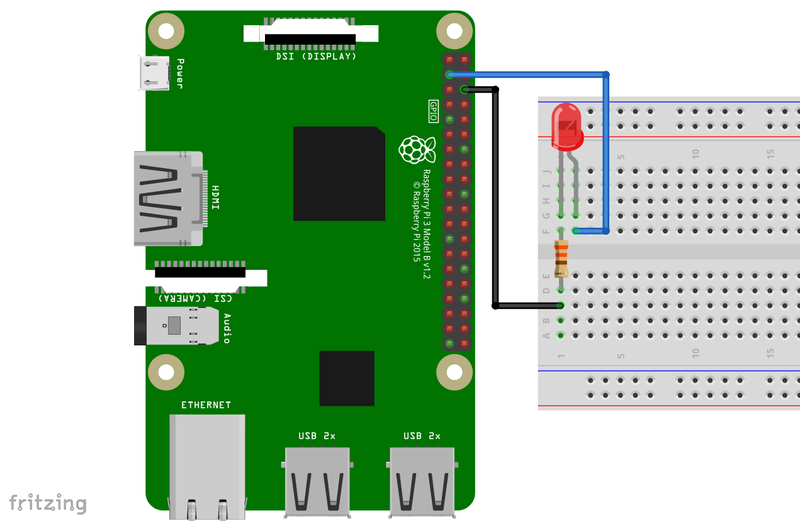 In this tutorial, we'll show you how to send data from cheap WiFi nodes to a Raspberry Pi over an internal WiFi network. It relies on the Flask framework for Python, which is a relatively simple-to-use method of creating a web application that can execute Python scripts. 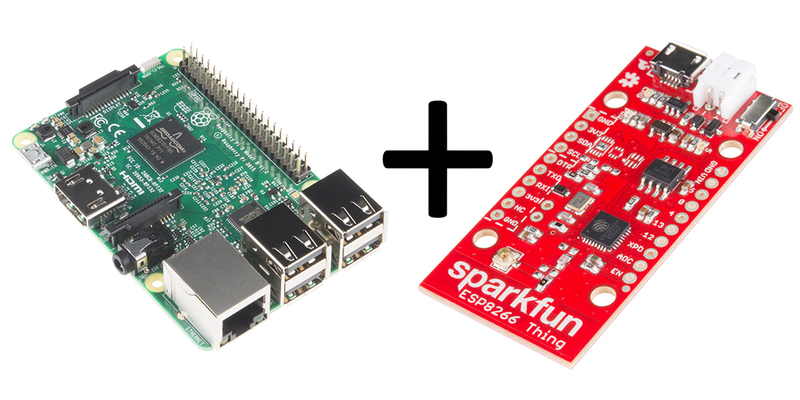 We'll use a Raspberry Pi 3 and SparkFun ESP8266 Thing to demonstrate. We're going to send a very simple signal from the Thing board to the RasPi - just a signal to turn an attached LED on or off. Hopefully, it'll be obvious from the example how to send more complex signals and run more complex scripts upon receipt. Before you tackle this project, there are a few other tutorials you may want to check out. You'll need the items on this wishlist to complete this tutorial. Substitutions can be made; a Raspberry Pi Zero W can be substituted for the Pi 3, for instance, and individual components can be sourced instead of the full starter kit. You'll need to do some basic breadboarding to prepare for this tutorial. Don't worry, we'll walk you through all of it. The connections for the Pi are simple: we're just connecting one LED to GPIO pin 2. See the Fritzing diagram below for information on how to do that. Hook up two of the buttons as seen in the Fritzing diagram below. One of the buttons will turn the remote LED on, the other will turn it off. We're going to assume that you're capable of soldering the headers onto the ESP8266 Thing board yourself, but if you need some help, check out our soldering tutorial. This is also where you'll use the long, centered breakaway headers. A six-pin group of them inserted into the breadboard aligned with the programming pins on the Thing will give you a place to plug in the FTDI board. Let's get down to business and program the Raspberry Pi to serve a web app that we can use for data connection. This tutorial assumes that you have some familiarity with Linux and Python to follow along. The first step is adding support for Flask to the RasPi. Python is already installed and support for using GPIO through Python, so we don't need to worry about that. All of these commands can be run either on a serial terminal opened on the Raspberry Pi directly with the Pi hooked up to a monitor, or remotely with a Pi via an SSH connection. However, we're not going to get into how to set up and run a Pi without a monitor. The first thing you need to do is install the Flask framework. There are a lot of additional packages that can be used with Flask, but we only need the basic package for this tutorial. Next, we're going to create the directory within which the app will run. These commands will create the directory and ensure that you're working inside that directory. The next step is to create a blank Python file in the directory called "app.py". This is the file that we're going to put our code into. Open that file in your favorite text editor (the Pi has vi, nano, and a textpad). Then put the following code into it. #  gpio/x/y, the Flask app will attempt to parse that as x=pin and y=level. #  route will result in a 404 error. First, there's no error checking here. The message is passed as the path requested via an HTTP request, and that request can contain just about anything. A request of the format GET /gpio/2/0 will set the pin low, for instance. However, GET /bats/are/bugs is equally valid, it just won't do anything and the app will return a "404 error." Second, the parameter host='0.0.0.0' is required to let the app know that you want the application visible to external clients. If you omit this, you'll still be able to test the app by visiting localhost:5000 in a web browser on the Pi, it just won't be visible externally. Third, the most commonly used port number is 5000, but you can use any port you want. Now we'll need to program the Thing. This portion assumes that you've followed the SparkFun ESP8266 Thing hookup guide and can program the ESP8266. Here's the firmware that I've written to send the proper page requests to the Raspberry Pi. //  Flask app only supports pin 2. // Repeat the process for pin 13. First, the IP address and port number in the functions http.begin() are mine from development. You'll have to change them to match the IP address and port number used on your Raspberry Pi. Second, don't forget to put in your SSID and PASSWORD for your wireless network. You should see a message, then, like the one below. As you can see, I pressed the buttons a couple of times to show you what it looks like when a client makes an HTTP request. Flask reports the IP address of the client, the date and time stamp of the request, the contents of the request, and the result of the request (in this case, 200, or "success"). This is a useful tool to make sure that your requests are actually making it through to the Flask server and not disappearing into the ether somewhere. Now that you've successfully got Flask framework up and running between a Raspberry Pi and ESP8266, it's time to incorporate it into your own project!